Announcement All my items are handmade, unique design, made from high quality yarns. All the slippers shown in the photos are DEMO models and after their pictures have been taken they are distributed to family and friends, whose task is to wear them frequently and provide me with feedback which helps me perfect each model. All my items are handmade, unique design, made from high quality yarns. All the slippers shown in the photos are DEMO models and after their pictures have been taken they are distributed to family and friends, whose task is to wear them frequently and provide me with feedback which helps me perfect each model. Love love love them. They will be the perfect “end of the night” shoe for my daughter’s wedding! They are nice and cozy. They keep my feet warm but not to the point where they are sweating. My Etsy story began by chance, without a clear idea or a plan. The shop began to sell rather well, and she needed an extra pair of hands to help her. I started doing small things for her, while having a lot of fun in the process. 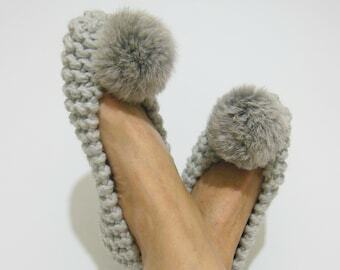 This is when I decided to make myself a pair of slippers that I have always dreamed of: soft, warm, and cheerful. A pair that would make me happy when I would put it on in the morning. 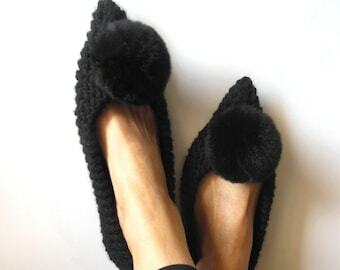 And so, I began experimenting with different techniques, fabrics, and colors, until I have, through some trial and error, made myself the perfect slippers that I absolutely adored. Then, I decided to share my perfect slippers with the world. And this is how it all started. 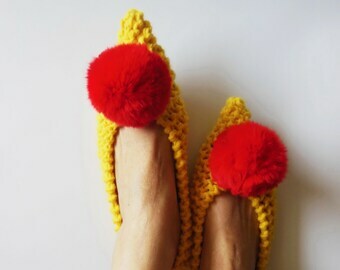 I opened a shop on Etsy, and decided to give my slippers a chance to be worn and adored by each and everyone on this planet. I put a lot of love and care in my work and all items are made by myself so I hope you are going to be happy with your orders. If you are not satisfied with your order I will happily exchange the item or give you a full refund. However, items must be in their original condition and must be returned within seven days of receipt. Shipping fees are not refundable . Please,first contact me via email or convo to let me know and then you can send back the item in a condition you received it, and then I'll refund the money when I get the item. If you don't have PayPal account,you can pay with any credit or debit card with Visa function on PayPal website,without having to be a member. I ship items that are in stock within 1-3 business days after I receive payment. Custom orders will be shipped as soon as they’re done. Your order will be shipped via registered air mail in padded envelope. Once I receive your payment, I will notify you that your order is shipped and provide you with the tracking number and photo of finished item made before packing and shipping. Sometimes packages are held in customs. Please be aware that during holidays the delivery times may vary. The package will be shipped to your Etsy address, not your Pay Pal address, so please make sure your Etsy address is correct prior to placing your order. If you want me to send your item to a different address than the one you have on Etsy, please let me know. Most of my pieces are in stock and ready to ship,but if you want something customized for you please contact me I will be happy to help you.